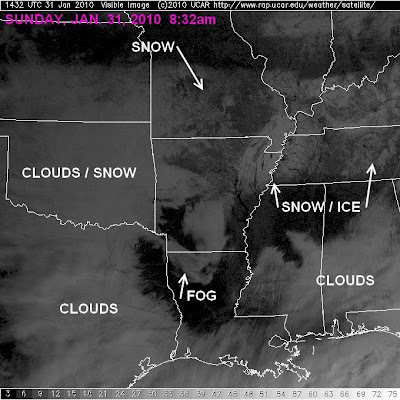 Satellite imagery and graphics from the National Weather Service show snow/sleet and ice accumulations from the winter storm on 1/29/2010. The heaviest icing occurred in southern west TN east of the metro area, while the heaviest snow was in a swath just south of Jackson and across the northern counties of west TN, northeast AR, and the Missouri bootheel. As indicated in yesterday's post, amounts tapered quickly from north to south across the metro area. Given the expectations Mid-Southerners had this week heading into our second winter storm of the month, many were not disappointed in the results and forecasts largely ended up verifying pretty well. The biggest complaints though probably came from Big Shelby, where predicted snowfall just didn't materialize. Forecasters knew heading into this one that "the line" that divided the snow-have's from the snow-have-not's would be very close to the city and that the infamous "I-40 corridor" would likely be about where the precipitation "classes" were divided. That's almost exactly how it happened. Take a look at the graphic above for selected precipitation totals. To illustrate the point, check out the snow measurement in Tipton County (from Atoka and Brighton, north of Shelby County) - 6". Then look at the Millington total in northern Shelby County - 2.5" of snow and sleet. Bartlett, in central Shelby County, ended up at about 1.5" of snow, sleet, and freezing rain. The Memphis airport, southern Shelby, had mostly freezing rain and got 0.75" of liquid water equivalent (melted precip). Areas north of the bottom row of counties in Tennessee got mostly snow and reports were consistently 6-9" (more north). If the precipitation had been all snow along the southern tier of counties, Memphians would also be buried under 6-8" of snow. Going further south, areas south of Tupelo to Oxford to Tunica got mostly rain (with a transition zone of about 1/4" of ice through the towns mentioned). This shows just how difficult forecasting winter precipitation can be in this area of the world. Over about a 75-mile zone, precipitation type changed from all snow to mostly rain, with a mix between. Even 24-48 hours out, that zone can be very hard to define as there are so many variables that can contribute to just how the atmospheric temperature profile will play out. As far as impacts, in the metro area, power outages reached over 20,000 last night in MLGW's service area (outage map), but have leveled out near 5,000-6,000 this morning. Power outages are still possible today with ice-covered branches and power lines and a wind that will be steady enough to possibly down some of those branches and lines. Roadways are treacherous and travel should be avoided if possible today. With a high in the upper 20s, conditions won't improve much if at all. Even Sunday could still see hazardous roads as temperatures bottom out in the teens tonight and only climb to near 30 by afternoon. Full sun will help in the melting process somewhat. Finally, by Monday, we should see some recovery and melting as temps climb into the 40s. My deep appreciation to all of you who count on MemphisWeather.net, the MWN Blog, our Facebook site and Twitter feed for your weather information during adverse weather. Thank you all. Stay warm and be safe! .ARCTIC AIR WILL REMAIN IN PLACE ACROSS THE MID SOUTH TODAY. SLEET AND SNOW WILL OCCUR TONIGHT. ICE COVERED ROADS MAY OCCUR. A WINTER STORM WARNING REMAINS IN EFFECT UNTIL 6 AM CST SATURDAY. AND SLEET ACCUMULATIONS OF 1 TO 3 INCHES ARE EXPECTED. EVENING. LIGHT SNOW MAY OCCUR LATE TONIGHT. * ICE ACCUMULATIONS WILL CREATE DANGEROUS DRIVING CONDITIONS. SNOW AND SLEET ACCUMULATIONS ARE ALSO POSSIBLE. * ICE ACCUMULATIONS MAY CREATE DANGEROUS DRIVING CONDITIONS. SLEET ACCUMULATIONS ARE ALSO POSSIBLE. So far, reports from around the metro area have included a wide variety of mixed precipitation, with northern counties getting mostly snow and north Mississippi getting a fair amount of ice and some snow. The average amount of precipitation on the ground appears to be about an inch in the city and suburbs. Precipitation started around rush-hour this morning as freezing rain/sleet, but transitioned to sleet and snow for most folks by mid-morning. Just when we thought the snow would start piling up (and quickly got to about an inch north of I-40), freezing rain and sleet were back, tamping down the snow totals and turning the fluffy white into a crunchy, slushy mess. Areas to our north and east have been harder hit, especially by snow, this morning. Reports across northeast AR and northwest TN range from 2-6" of snow this morning, with a mixture of some sleet also falling early. To the south of the metro, ice is accumulating to around 1/4"-1/2" at this time (1:30pm). For this afternoon, I expect atleast one more round of precipitation, which is approaching the city now (MWN StormView Radar). Some of it could be moderate and most of it will fall as a sleet and snow mixture, transitioning to snow by late afternoon and continuing through the evening hours. Total accumulations may be down slightly from what was anticipated early in the day, thanks to the ice from this morning, but metro totals of 3-4" are still not out of the realm of possibility by Saturday morning. Mid-Southerners should exercise extreme caution on the roadways this afternoon, traveling only if absolutely necessary. The ice and snow mix, with temperatures below freezing, has created a frozen slush on the secondary roads and likely not much better on the primary roadways and interstates. Bridges and overpasses will be treacherous. Any additional accumulations will only make conditions worse. On a side note: Technical difficulties are still plaguing the WXLIVE! current conditions from Bartlett. They may be intermittent through the day. In addition, no precipitation totals are coming from the automated equipment - the gauge is frozen! Get the latest weather conditions and join in the conversation with MemphisWeather.net on Facebook and Twitter! A powerful weather system will bring a major winter storm to the Mid-South over the next 24 hours. All the ingredients are falling into place, including moisture, lift, and temperature profile, to dump significant ice and snow, which will render travel hazardous to treacherous. Mid-Southerners are asked to avoid travel Friday if at all possible. Don't let your guard down just because there is nothing going on yet this morning! The graphic above illustrates the potential - a high likelihood of 4"+ of snow (upper-left), a moderate likelihood of 8" of snow (upper-right), an off chance of some places receiving a foot (lower-left), and a high likelihood of significant ice (1/4" or greater - lower-right). Residents in the southern part of the metro area (southern Shelby/Fayette, DeSoto, Marshall, Tunica counties) have the greatest risk for even more ice (up to half inch), while the northern portion of the metro area runs the greatest risk of seeing 6-8" of snow. Areas that see 1/4" of ice or more can prepare for the possibility of extended power outages and tree damage (outage map for Shelby County). I expect precipitation to start in the next two hours as freezing rain, possibly moderate at times, mixed with some sleet. By late morning, it will begin to transition to sleet and snow. Snow could be heavy at times this afternoon and a clap of thunder is possible. The kind of lift that produces thundersnow will enhance snow/sleet rates to over 1" per hour. By evening, the heavy precip will be moving east, but snow showers could continue much of the night for an additional inch or two accumulation. Once again, do not travel unless there is an absolute need. All school systems in the area are closed. Enjoy your snowman-building and sledding, kids, but be very careful on any ice (you too parents)! TONIGHT AND FRIDAY WITH TEMPERATURES DROPPING TO BELOW FREEZING. SPREADING PRECIPITATION INTO THE MIDSOUTH BY LATE TONIGHT AND FRIDAY. WILL DROP INTO THE TEENS BY FRIDAY MORNING OVER PARTS OF THE AREA. DIGITS ACROSS THE NORTHERN HALF OF THE MIDSOUTH SUNDAY MORNING. IS NO LONGER IN EFFECT. AND SLEET ACCUMULATIONS OF 3 TO 6 INCHES WILL BE POSSIBLE. FREEZING RAIN MAY OCCUR LATE FRIDAY NIGHT. Graphics from the National Weather Service -Memphis on their expectations for ice and snow totals. Note to get everyone over-excited, but the overnight and morning computer model runs are painting a pretty bleak picture for the Mid-South as this storm approaches. The NWS graphics above are indicative of that and show the probabilities of 4" and 8" of snow (upper-left and upper-right, respectively) and 1/4" of ice (lower-right). 1. Precipitation overnight will be scattered at best, light in intensity, and will likely be in the form of rain with some sleet mixed in. 2. 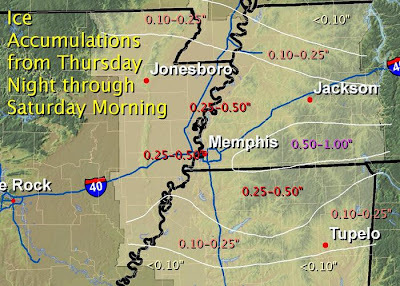 The bulk of the precipitation in the Memphis area looks to fall between 9am and 4pm Friday as a "wintry mix." It will likely start as freezing rain, but sleet and snow will mix in, especially in the afternoon. Areas to the north will have a better chance of seeing more snow/sleet and less ice. 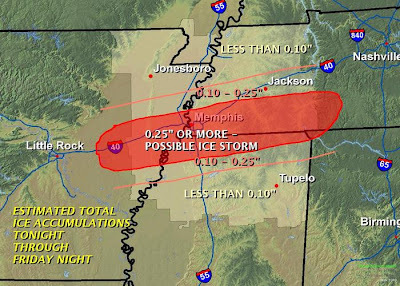 North MS will see less snow/sleet, and more rain, with still some significant ice possible. 3. Accumulations could be significant. Total "liquid precip" for this event could go well over an inch. It appears as though up to half of that could be freezing rain, the other half sleet/snow. That would work out to at least a few inches of sleet and snow mixed in with the freezing rain. My forecast as of 10am calls for 1/2" of ice and 2-5" of snow and sleet. The lesser amounts would be over north Mississippi with higher amounts possible for Tipton Co. and points north. As you can tell, Memphis is once again "on the line." 4. Wind will be brisk and gusty. This could exacerbate icing problems as tree branches and power lines may have a hard time holding ice and also getting blown around. Be prepared for the possibility of power outages, which could be extended. 5. Temperatures will not recover much at all on Saturday and only a little on Sunday. It could be early next week before the ice completely melts given the expected conditions and accumulations. Complete details are available in the MWN forecast. Folks, this is a storm to be taken seriously. Prepare for hazardous driving conditions by mid-day Friday and continuing through Saturday. Plan to be off the roads during this time unless absolutely necessary. Day shift workers may go to work in the morning and think "this is not too bad," then not be able to open their car door when they leave at the end of the day. Be prepared (ice scrapers, plenty of gas, etc.). There is also a distinct possibility of power outages and tree damage due to the weight of the ice. For comparison purposes, some of you were in Memphis in 1994 and remember the January ice storm. The city received about 1.25" of ice and a couple inches of snow with that storm, so the ice accumulations aren't expected to be nearly that high, but we could receive more snowfall. MemphisWeather.net will have all the information you need as this storm unfolds. Be sure to follow MWN on Facebook and Twitter. They'll be the easiest to update and communicate to you through. Finally, I send my apologies for the overnight down time for parts of MemphisWeather.net. Seems like the weather computer decided to go on the fritz AS A WINTER STORM WAS APPROACHING! Most of the site is functioning once again and StormView Radar with its "Winterizer" feature will hopefully be operational again tonight. Hopefully it will hang in there... of course, it's worth noting that if a power outage were to occur, live data and weather alerts would not flow to the website. The upcoming winter storm is the headline-grabber of the day for the Mid-South. A Winter Storm Watch will go into effect tomorrow at 6pm, though it appears right now that wintry weather in the metro area will hold off until at least midnight or later (early Friday morning). The computer model runs of the past 24 hours or so are indicative of why forecasting winter weather in this part of the world is so difficult. Precip onset, amount, and types have changed (at least slightly) with nearly every set of model data in one way or another. However, one thing has not changed, and that is that it doesn't appear we will dodge this storm completely. Based on what I am seeing this morning, my thinking has changed very little from yesterday at this time, as I have yet to see any model trends or convincing enough data to change my mind. I expect scattered rain showers to start breaking out Thursday afternoon and continue in a more-or-less scattered fashion through the evening hours. After midnight, those showers will likely become steadier as low pressure moves into southern Louisiana and "overrunning" takes place (in which moisture is transported from the south over a frontal system or cooler air at or near the surface). In addition, northeast wind will pick up on the back side of a front that will, by that time, be to our south. The northeast wind will help to bring colder air in the lowest levels of the atmosphere (lowest couple thousand feet) and surface temps will fall. Meanwhile, thanks to southerly air aloft, warmer air will be in place on top of the cold air, setting up an icing scenario (see the schematic below that diagrams the precipitation types). All of this to say that, as the cold air moves in at the surface, temps continue to fall and rain turns to freezing rain, possibly mixing with sleet at times. I believe this will occur in the wee hours of Friday morning (between midnight and 6am). That timing is one of the question marks that still exists in my book. After 6am, through about noon, is likely when the heaviest precipitation will fall. During this time, models are having a little more difficulty in this morning's run pinpointing precipitation type. The general consensus is freezing rain, or glaze. One reputable model actually introduces colder air into the warm layer during the morning, possibly changing the metro area over to sleet and/or some snow. During the afternoon, there again is some consensus that the cold air begins to push into the warm layer aloft more completely, changing the precip to snow at some point during the afternoon before tapering off to flurries Friday night. Scattered showers Thursday evening mixing with sleet, then changing to freezing rain/sleet in the pre-dawn hours Friday. Freezing rain, maybe mixed with sleet, Friday morning, then changing to snow showers in the afternoon and tapering to flurries Friday night. Temps - will drop near freezing after midnight Friday and stay in the 30-32 range through Friday morning, then drop into the upper 20s Friday afternoon. Wind of 15-20 mph gusting to 25-30 mph will put wind chills in the teens. Accumulations - I knew you'd ask! Best guess at this point is for 1/4" to as much as 1/2" of ice and 1-2" of sleet/snow in the metro. Less ice, more snow to the north. Less snow to the south. Some areas of west Tennessee north of the southern tier or two of counties could get mostly snow and end up with 4-6". For more on the rest of west TN, I encourage you to check out West Tennessee Weather Online and my good friend Eddie Holmes. This storm is one to actively take preparations for. Though there is still a chance that it may not be as bad as we're painting it right now, you should prepare for hazardous road conditions, possibly treacherous on bridges and overpasses and scattered power outages due to ice on power lines and falling tree branches onto power lines (the wind gusts will not help this situation). Following the storm, very cold air will sit over the region through the weekend. It could be Sunday before the sun comes out, and it could be Monday before temperatures climb enough to really complete the melting process. Lows in the teens are expected in the city Sunday morning, so it will be frigid. Check out our Cold Weather Tips. MemphisWeather.net will have this storm covered from all angles. Check out the resources below, set your bookmarks, and thanks for relying on MWN as your local weather source! StormView Interactive Radar - with winter mode, to see whether it's snow, ice, or rain! THE SINGLE DIGITS AND TEENS BY FRIDAY MORNING. POSSIBLE WARNINGS AS THE EVENT COMES INTO GREATER FOCUS. FLURRIES MAY OCCUR FRIDAY NIGHT. SNOW...SLEET...OR ICE ACCUMULATIONS THAT MAY IMPACT TRAVEL. Take your Dramamine - a roller-coaster weather week ahead! We'll have enough different types of weather this week to make just about everyone happy, upset, or perhaps downright disgusted depending on how it all plays out! Our roller coaster begins at the bottom of the hill today as an upper-level trough of low pressure is positioned to our north and extends south into the region. This trough trails yesterday's cold front which brought a round of thunderstorms to many folks in the area in the late afternoon and even some reports of pea-sized hail (up to dime sized in West Memphis). The trough is responsible for the increased cloudiness, a few spits of light rain, and cool temps today. In addition, high pressure over Texas is combining with a large low pressure system to our north to produce windy conditions. Thus, a Wind Advisory is in effect today as gusts this afternoon will reach 35-40 mph. Tonight, we begin a slow uphill climb as cool and clear conditions prevail and continue into Tuesday. We reach the peak of the roller coaster's ascent on Wednesday with mainly dry conditions and highs back into the 50s, though the foreshadowing of the next descent arrives with clouds on the increase. Heading into Thursday, we'll see the tide turn and the descent begin as rain moves in. Some of the rain could be heavy at times and a clap of thunder is possible as a potent winter low pressure system moves from TX into the Lower MS River Valley. On the backside of the low, temps plummet as cold air rushes in from the north. It appears precipitation continues however, bringing us a decent chance of wintry weather starting sometime late Thursday and into Thursday night, when temperatures will fall below freezing. Precipitation types and exact timing are much to difficult to pinpoint 4-5 days out, but it appears that rain could change to freezing rain Thursday evening in the metro area (earlier to our north and west), mixing with sleet and snow as the cold air strengthens its grip, before ending as light snow Friday (more on precip types). Certainly the scenario bears watching as the potential exists for a fairly disruptive ice storm. It's simply too early and too many computer models will be run between now and then to make a certain call, but plans should be made for the possibility of winter weather late in the week. We bottom out again on the meteorological roller coaster as cold air of Arctic origin mostly likely brings lows back into the teens on Saturday and Sunday mornings with highs possibly staying below freezing on Friday and Saturday. 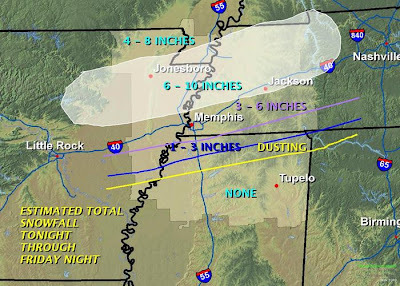 Stay with MemphisWeather.net (click here for the forecast) and the MWN Blog for the latest on the upcoming winter weather possibilities. Remember that you can sign up for free weather alerts from MemphisWeather.net via e-mail or Twitter by visiting this page or following @shelbyalerts. The Storm Prediction Center (SPC) has their meteorological spectacles focused on the Mid-South this morning as low pressure north of Little Rock moves east. Temperatures aloft are very cold with this system, surface temperatures are warm (headed for the 60s), moisture is in place (high humidity values), and wind at all levels of the atmosphere are favorable -- all of the ingredients for possible severe weather. The region has been under a SLIGHT RISK of severe weather for this afternoon since yesterday. Just before 10am, a Mesoscale Discussion was issued by SPC indicating conditions becoming favorable for large hail and possible tornadoes as the low moves into our area. They expect, and I concur, that scattered to numerous storms will develop ahead of the low in the warm sector, some of which could become supercellular and severe. The most likely timeframe for severe weather appears to be between noon and 4pm in the metro area. It is also important to note that, as of this month, the severe weather criteria (which would prompt warnings to be issued and verified) now includes any of the following: 1"+ hail (quarter or larger), 58+ mph wind, or a tornado. The hail threshold was raised from 3/4" on January 5. Torrential downpours and constant lightning do not necessarily make a thunderstorm severe. Stay with MemphisWeather.net for the latest on the developing scenario, including the latest watches and warnings and regional and metro StormView Radar. Make sure your NOAA Weather Radios are ready for action or sign up to receive severe weather alerts from MWN by e-mail or on Twitter. As discussed early this week ("A Pattern Shift in the Making"), the prolonged cold snap earlier this month is but a distant memory as we are now in a much more active pattern with mild temperatures and storm systems affecting the region frequently. This morning, some of you might have awakened to our first thunder in 2010 as an upper-level impulse rolled through with enough elevated instability to produce some lightning and thunder in the pre-dawn hours. Rainfall totals came in between 0.25-0.75" depending on your location. Yet another system, this one stronger and surface-based, will move into the region tonight. While a chance of showers and a few thunderstorms exists today, most residents of the metro area will see more dry hours than wet ones through the day and evening. By midnight, the approaching low pressure will be shifting quickly into the region and showers and thunderstorms will be a good bet. Rainfall totals from this next round will likely be 1.5-2.0" for just about everyone with some isolated higher amounts, so the National Weather Service has issued a Flash Flood Watch effective from 9pm tonight to 3pm Thursday. In addition, the Storm Prediction Center has placed the area under a slight risk of severe thunderstorms for the overnight hours tonight (see graphic above), calling for the possibility of a line of storms with possibly damaging wind and hail after midnight. The strongest weather, including the possibility of tornadoes, is expected to go by to our south. However, with a good fetch of Gulf moisture being fed in on southerly wind, the approach of surface low pressure and a favorable jet stream overhead, some thunderstorms could become severe overnight and early Thursday. A few showers and thunderstorms could also form during the afternoon hours Thursday ahead of the main cold front. Thursday will be a windy and mild day, which would aid in the development of additional scattered precipitation later in the day. With the possibility of severe weather, check out MWN's newest feature - automated delivery of severe weather alerts for Shelby County on Twitter! If you use Twitter, be sure to follow @shelbyalerts (http://twitter.com/shelbyalerts) to get weather warnings as they are issued. It's the perfect product to use for mobile alerts, so be sure to select "Send to Mobile Phone" when you follow! If you aren't on Twitter, you can still get weather alerts by e-mail as well. For more information on both of these services, check out the Weather Alert Notification page on MWN. .A STRENGTHENING AREA OF LOW PRESSURE OVER THE CENTRAL PLAINS WILL MOVE INTO THE MISSISSIPPI VALLEY TONIGHT AND THURSDAY. THIS WILL RESULT IN SHOWERS AND THUNDERSTORMS DEVELOPING ACROSS THE LOWER MISSISSIPPI VALLEY. CONDITIONS MAY BECOME FAVORABLE FOR HEAVY RAINFALL AND POTENTIAL FLASH FLOODING ACROSS THE WATCH AREA. * FLASH FLOOD WATCH FOR ALL OF NORTH MISSISSIPPI. * SHOWERS AND THUNDERSTORMS ARE EXPECTED TO PRODUCE HEAVY RAINFALL ACROSS NORTH MISSISSIPPI TONIGHT INTO THURSDAY MORNING. * TWO TO FOUR INCHES OF HEAVY RAIN MAY PRODUCE FLASH FLOODING ACROSS THE WATCH AREA TONIGHT INTO THURSDAY MORNING. With all of the recent earthquake activity across the globe, I thought it would be a good time to review the earthquake threat that the Mid-South faces on a daily basis. Though not specifically weather-related, earthquakes fall into a broader "geography" or "earth sciences" category, of which meteorology is also a part. Therefore, it is appropriate to address here. We should be reminded that we live very near the New Madrid Fault System, which produced one of the strongest earthquakes in U.S. history 199 years ago (1811) and has the greatest earthquake risk east of the Rockies. 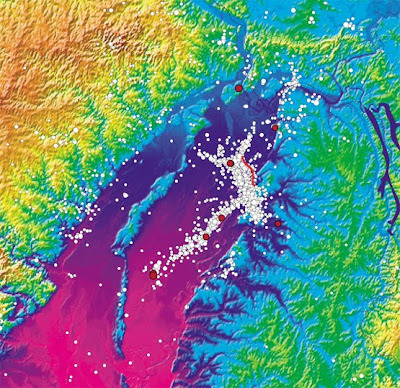 A Fact Sheet published by the USGS details the continuing threat that this fault poses. In addition, an urban seismic hazard mapping report for Memphis was published by USGS in 2006 which may be of interest. I would invite you to use this opportunity for education - know what you need to do to be prepared should an earthquake strike and what to do during and after a quake. The Fact Sheet quoted above indicates that the region could see landslides along the river bluffs, "ground failures [...] including soil liquefaction along the Mississippi River floodplain," impassable roadways due to bridge collapse or fissures in the road surface, disruption of agriculture and farmland flooding that could contaminate water sources, and failure of levees and riverbanks. With it's aging infrastructure, Memphis is "particularly vulnerable when subjected to severe ground shaking," including the possibility of building failure due to their being built prior to the writing of code that require seismic resistance. None of this is meant to cause fear or worry, but instead to serve as a reminder that education and preparedness are key. Who knows when "the big one" may strike, but there is no indication that sometime in the future it won't. My apologies for having taken some time off from the blog after the recent Arctic outbreak. I guess I was thawing my fingers. The finger-thawing weather will continue for the foreseeable future, though with some temps in the 60s the past few days, I don't think there is any thawing left to be done! While temps averaged over 15 degrees below normal for the first 10 days of January, highs have rebounded into the mid 50s to lower 60s the last 4 days and the forecast points to more of the same for at least the next week. Also of note, yesterday and today's rainfall of between 1.0-1.5" was the first rain of 2010, a full 16 days into January! Of course, we can't forget the few hundredths of an inch of liquid precip we picked up with the snow on January 7, but this was the first rain since December 31. This marks the latest "first rain day" to start a year in at least 15 years, which is how far my available records go back. Looking ahead, following the Arctic intrusion that blanketed the eastern half of the nation to start the year, we are now in the midst of a "pattern shift" which will signal a significant change in U.S. weather patterns over the coming couple of weeks perhaps. During the first two weeks of January, the upper level pattern was marked by a large scale trough (upper level low pressure) over the eastern U.S. and a ridge over the west (upper level high pressure) (see graphic of the upper-level pattern on January 5, courtesy Storm Prediction Center, above). Gradually that pattern has shifted to something more akin to El Nino years. We now will be seeing a flatter upper level pattern (lower amplitude troughs and ridges) with a strong jet stream pointed straight into the southwestern U.S. and northwestern Mexico (see graphic above valid mid-week; click for larger version). This pattern will mean frequent and strong storms for California, which will then move across the southern Rockies, southern Plains, and into the southeast U.S. More benign weather, outside of clipper systems from Canada, are expected across the northern tier of the U.S. So, if you are watching The Weather Channel or even national news, you'll definitely be seeing stories on the emergence of an El Nino weather pattern and probably flooding and mudslides in southern CA and feet upon feet of snow for the Sierra range. For more on the pattern shift and effects on our west coast neighbors, see Paul Yeager's excellent post "Storms to Blast California." For the Mid-South, this will mean milder weather with storm systems approaching from the west or southwest that will bring rain every few days and perhaps setting the stage for one or more of these systems to bring the threat of some thunderstorms. The milder weather is due to the fact that these storms will be of Pacific origin and not Canadian origin. Between systems, with some sun, temperatures will have no problem reaching the 50s and 60s and overnight lows should remain "mild for January." More details will be found in the forecasts posted on MemphisWeather.net. Wintertime can produce some absolutely amazing sunrises. Many times, high clouds are present with clear dry air below, which allows for the sun's rays to light up the high clouds before the sun reaches the horizon. I'm not sure what else it is about winter, but I've seen more spectacular sunrises in winter than any other time of year. Back on December 16, I was fortunate enough to anticipate a great sunrise over Bartlett, TN and grabbed the video camera, setting it up on a tripod pointing west-southwest. With assistance from the official videography service of MemphisWeather.net, Gemini Media Transfer Service (or Gemini Multimedia), a time-lapse of about 30 minutes of video (taken between about 6:30-7:00am) was shortened to just over 30 seconds. Check out the results below. If I didn't know better, I would think we had two sunrises that morning! Let me know what you think. You may also click here if the video above does not display. Arctic Express update, school closings polls, and a huge thank you! The coldest weather in 13 years (since winter of 1996) will continue for about 24 more hours before moderation begins, and then downright AVERAGE conditions return next week. Right now, I'd settle for average. My best descriptor for the current cold blast is "unreasonable." I don't throw out opinions on school closings here on the blog, as I don't envy the job that the administrators have when deciding whether or not to cancel classes. There always a contingent that feel like the wrong decision was made, whether it was to cancel or not, and usually it's not a "no-brainer" decision. A pair of polls I conducted (unscientfically) regarding Thursday's cancellations proves the point. The results will be posted in the sidebar of this blog through the weekend. For those whose children were OUT of school on Thursday (in Shelby County, that would be the county students), two-thirds liked the decision to cancel, one-third thought the kids needed to be in school. For those whose children were IN SCHOOL Thursday (Memphis City, among others), it was just about the same - one-third thought being in school was the right thing and all of the rest but one thought they should have been out. One person expressed no opinion. Overall, it looks like two-thirds of my readers (who expressed an opinion) thought the kids should be out. I also want to thank so many of you for making MemphisWeather.net, this blog, and the social media side of MWN one of your trusted sources during this winter weather episode. The numbers are in and they are simply incredible. Two of the top four days in the blog's history with respect to visitor count (and 3 of the top 10) were this week. A new record for visitors and page loads was established, besting the previous mark by almost 50%! On the website, numbers were similar - 2 of the top 4 days for visitor counts and 2 of the top 5 for pages loaded were this week. I am so appreciative of the trust you have placed in MWN to be an accurate and comprehensive source of information in times when it really matters. It is not something I take lightly. Again, many MANY thanks! We have some great things in the planning stages for 2010 and I am looking forward to making them available to you in the coming months, in order to build on the solid foundation that has been laid. For a complete list of regional closings, visit WMC-TV. The list of closings will also be updated in the right sidebar of this blog. Get the latest weather conditions and much more by checking out MemphisWeather.net on Facebookand Twitter! WHILE ARCTIC AIR WAS ENTRENCHED ACROSS THE MID-SOUTH THIS EVENING... A REINFORCING PUSH OF EVEN COLDER ARCTIC WAS WAS POISED TO DROP INTO THE MID-SOUTH FROM SOUTHERN MISSOURI. THIS ADDITIONAL PUSH OF ARCTIC AIR WILL RESULT IN OCCASIONALLY GUSTY WINDS OVERNIGHT AND THE COLDEST TEMPERATURES OF THE WINTER THUS FAR. BY SUNRISE... WIND CHILLS ARE EXPECTED TO BE AROUND ZERO DEGREES OVER THE MEMPHIS METRO AREA. WIND CHILLS WILL LIKELY REACH ADVISORY CRITERIA AGAIN FRIDAY NIGHT ACROSS THE MID-SOUTH. * NORTHWEST WINDS BETWEEN 10 AND 15 MPH WITH GUSTS TO 25 MPH WILL OCCUR OVERNIGHT TONIGHT. * THE WINDS... COMBINED WITH TEMPERATURES FALLING TO READINGS NEAR 10 DEGREES... WILL PRODUCE MUCH COLDER WIND CHILLS THAN HAS BEEN EXPERIENCED THUS FAR THIS WINTER. A WIND CHILL ADVISORY MEANS THAT VERY COLD AIR AND STRONG WINDS WILL COMBINE TO GENERATE LOW WIND CHILLS. THIS WILL RESULT IN FROST BITE AND LEAD TO HYPOTHERMIA IF PRECAUTIONS ARE NOT TAKEN. IF YOU MUST VENTURE OUTDOORS... MAKE SURE YOU WEAR A HAT AND GLOVES. ADDITIONAL COLD WEATHER TIPS AND THE LATEST FORECAST CAN BE FOUND AT MEMPHISWEATHER.NET. Winter weather recap for 1/7/10 - where's all the snow? Another borderline winter weather case for us meteorologists to try and figure out! This time, it has made a little easier by being fairly confident in the precip type, and the timing wasn't bad either. The amounts were shifting (mostly down) each day for the last several though, as we looked at new computer model data up to four times a day. What at first glance last weekend looked like a system that could produce up to 2-4" of snow across the region looked a less impressive each day. By late Tuesday, it was becoming more obvious that this weather system would be less about the snow (though 1-2" was still expected) and more about the extreme cold behind it. Even as late as yesterday, computer models were still insisting on close to an inch for the metro area (one typically reliable one even gave us 2" as of yesterday morning), but the trend was for heavier snow to go by to the north of the region closer to an upper level low and another batch to go by to the south, with the Memphis area stuck in between. This is almost exactly what happened. Snow amounts were generally right around a quarter inch in the Memphis metro (my observation was 0.2" in North Bartlett), with about half-inch to an inch over northeast Arkansas and across northwest Tennessee. Not exactly what we were hoping for, or predicting, but I'm not totally shocked to see. TDOT, county, and city officials were out this week in full force treating the major thoroughfares, interstates, bridges, and overpasses with salt brine. This pre-wetted solution, 23% salt and 77% water, is applied as an anti-icing agent. It works down to about 20 degrees by melting snow as it falls on the road and washes off with rain. From having traveled this morning on roads that were both treated and not, it appears that this proactive step worked well. Treated roads, even with below freezing temperatures, were wet (the untreated road shoulders were snowy). I came across some icy patches and even some minor snow cover on secondary roads and untreated areas. For more info on TDOT's winter weather plans, including many stats, check out this link. As for school closings, there are some pretty heated discussions going on on both sides of the proverbial "aisle" this morning. Many kids outside of the city of Memphis are thrilled, some parents are taking it all in stride, but many more are upset - both in the city and county. I've read comments by plenty of parents in the city who want to know why their children have to go to school when the county is out. I've also heard many complaints from parents of county school kids who say conditions don't warrant schools being called off. One thing snow does do in this area, no matter how much it is, is bring out the opinions of those affected, which is nearly everyone! Memphis City Schools have announced that they will be closing one hour early on Thursday, January 7, to allow additional time for transportation. All evening activities associated with MCS will also be cancelled. More info from WMC-TV. In households across the Mid-South, the mood is either very happy or disappointed after the mixed decisions regarding school closings today. Despite the perceived "bust" in the forecast (have I said before how hard it is to predict winter weather in the Mid-South? ), do not let your guard down against the extreme cold that is still on track (and easier to predict by the way!). After the Arctic front passes later this morning, temperatures will begin to drop as wind increases from the northwest. As I've already written about, the Arctic blast is for real. Temperatures that are on tap have not been seen in the region for over a decade. Lows will drop into the single digits nearly everywhere on Saturday morning and perhaps Sunday morning as well. High temps Friday and Saturday will top out near 20 and coupled with a steady and brisk wind, wind chill readings will be in the single digits during the day and near or below zero overnight. Expect Wind Chill Advisories over the next couple of days. Check out these Extreme Cold Weather Tips from MemphisWeather.net and be careful on the bridges and overpasses as temps drop and patches of black ice become a reality. With the possibility of school closings on Thursday, know that this blog (http://blog.memphisweather.net/) and MWN on Twitter (http://twitter.com/memphisweather1) will have up-to-date school closing information for the metro area listed in the right sidebar. If you are reading this on the blog itself, a complete list of closings from Action News 5 will also be linked to the right. Get the latest winter weather conditions and much more by checking out MemphisWeather.net on Facebook and Twitter! While the snow will certainly pose an inconvenience and could make for poor driving conditions Thursday (by the way, I'm still expecting 1-2" for most of the metro area centered on the early half of the day), the bitter cold is the "big story" as far as I am concerned. While we have had our share of cold weather the past few days (3 area deaths have already been attributed to the cold), and with all due respect to Randy Bachman, "You ain't seen nothing yet." This streak of cold weather would eclipse the very cold weather that encompassed the region in Dec. 2000-Jan. 2001 when highs dropped into the 20s for several days (interspersed with highs in the mid 30s) and lows got as low as 11-12 on 3 days. The coldest days this weekend will be perhaps more similar to a spell in Jan. 1997, the last time Memphis had a single digit low temperature. From January 10-14 of that year, the highs were 36, 20, 24, 25, and 31 and the lows 10, 8, 13, 14, and 13. Mid-Southerners are urged to take all necessary precautions against the very cold Arctic air that has settled over the region and will be reinforced by tomorrow's cold front. Wind chill readings, thanks to a steady north wind ushering in the Arctic air, will fall below zero Friday morning and could drop as low as -10 or lower on Saturday morning, barely rebounding above freezing on Friday and Saturday as highs top out in the teens. A list of winter weather tips from MemphisWeather.net can be found here and are also linked from the front page of MWN. Get the latest weather conditions and much more by following or fanning MemphisWeather.net on Facebook and Twitter! The Winter Storm Watch has been replaced with a Winter Weather Advisory for the metro area for Thursday and it has been expanded south to cover the entire region. See the statement below and the map above for details. .AN UPPER LEVEL DISTURBANCE AND AN ASSOCIATED STRONG... ARCTIC COLD FRONT WILL SWING SOUTH INTO THE MISSISSIPPI RIVER VALLEY TONIGHT AND THURSDAY MORNING. THIS WILL SPREAD SNOW ACROSS THE ENTIRE MIDSOUTH... WITH A SNOW AND SLEET MIX SOUTH OF A WEST HELENA ARKANSAS TO TUPELO MISSISSIPPI LINE. GUSTY WINDS BEHIND THE COLD FRONT MAY ALSO LEAD TO SOME BLOWING SNOW ON THURSDAY. THE NATIONAL WEATHER SERVICE IN MEMPHIS HAS ISSUED A WINTER WEATHER ADVISORY FOR SNOW AND BLOWING SNOW. THE WINTER STORM WATCH IS NO LONGER IN EFFECT. * SNOW ACCUMULATIONS OF 1 TO 2 INCHES ARE EXPECTED LATE TONIGHT AND THURSDAY MORNING NORTH OF A LINE FROM WEST HELENA AR TO TUPELO MS. SOUTH OF THIS LINE... SNOW AND SLEET ACCUMULATIONS OF 1 TO 2 INCHES ARE EXPECTED LATE TONIGHT AND THURSDAY MORNING. SOME FREEZING RAIN MAY ALSO MIX IN AT TIMES... BUT NO ICE ACCUMULATIONS ARE ANTICIPATED. * NORTHWEST WINDS BETWEEN 15 AND 25 MPH WITH GUSTS TO 30 MPH ARE POSSIBLE THURSDAY BEHIND THE STRONG COLD FRONT. * THE COMBINATION OF FRESHLY FALLEN SNOW AND GUSTY WINDS MAY LEAD TO SOME BLOWING AND DRIFTING SNOW THURSDAY. * THIS IS THE FIRST ACCUMULATING SNOW OF THE SEASON AND IS EXPECTED TO HIT THE MIDSOUTH DURING RUSH HOUR THURSDAY MORNING. EXPECT HAZARDOUS TRAVEL CONDITIONS LATE TONIGHT AND THURSDAY. My thinking has changed very little today with regards to the upcoming winter weather spell. The NWS has issued a Winter Storm Watch for all of west TN and northeast AR that begins Wednesday night at midnight and continues through Thursday at 6pm. This was issued less for snow amounts and more for overall impact. While snow amounts will generally be manageable (though "manageable snow" may be an oxymoron in this part of the country), the timing (impacts to Thursday AM rush hour), coupled with the very cold air and gusty wind right on the snow's heels make the watch the right decision as far as I am concerned. As to snow amounts and timing, my target snow accumulation for the metro area is 1-2", less over north Mississippi and more up towards Tipton County and north. It should begin after midnight Thursday morning, accumulating as soon as it starts, with most of it ending by 7-9am as the cold front moves through. Not a significant snow as snow storms go... However, behind the front, cold air will whip in on gusty northwest wind, creating some blowing snow conditions during the day as gusts reach 30 mph, and temps will fall through the 20s in the afternoon, reaching a low in the lower teens Friday morning with wind chill readings near zero. Very cold Arctic conditions will persist through the weekend. Please take all precautions against the cold AHEAD of this storm, rather than after the temperature has dropped into the single digits. You can find Extreme Cold Weather Tips from MWN by clicking here. .A VERY COLD AIRMASS HAS OVERSPREAD THE AREA THIS MORNING. TEMPERATURES IN THE LOWER TO MID TEENS COMBINED WITH WINDS OF 5 TO 10 MPH WILL PRODUCE WIND CHILLS OF ZERO TO 5 BELOW EARLY THIS MORNING ACROSS MUCH OF WEST TENNESSEE INCLUDING THE MEMPHIS METRO AREA. THEN AN UPPER LEVEL DISTURBANCE AND AN ASSOCIATED STRONG... ARCTIC COLD FRONT WILL SWING SOUTH INTO THE MISSISSIPPI RIVER VALLEY WEDNESDAY NIGHT AND THURSDAY MORNING. THIS WILL SPREAD SNOW ACROSS THE ENTIRE MIDSOUTH... WITH MODERATE ACCUMULATIONS POSSIBLE NORTH OF THE MISSISSIPPI/TENNESSEE STATE LINE. GUSTY WINDS BEHIND THE COLD FRONT MAY ALSO LEAD TO SOME BLOWING SNOW THURSDAY. THE NATIONAL WEATHER SERVICE IN MEMPHIS HAS ISSUED A WIND CHILL ADVISORY... WHICH IS IN EFFECT UNTIL 9 AM CST THIS MORNING FOR COUNTIES NORTH OF I-40... NOT INCLUDING SHELBY COUNTY. A WINTER STORM WATCH HAS ALSO BEEN ISSUED FOR ALL OF WEST TENNESSEE AND NORTHEAST ARKANSAS. THIS WINTER STORM WATCH IS IN EFFECT FROM LATE WEDNESDAY NIGHT THROUGH THURSDAY AFTERNOON. 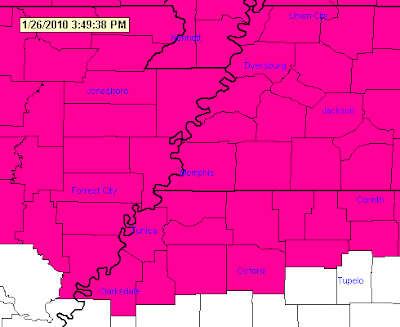 NORTH MISSISSIPPI IS NOT INCLUDED IN THE WATCH AT THIS TIME. * WIND CHILL READINGS WILL BE NEAR OR SLIGHTLY BELOW ZERO THROUGH 9 AM THIS MORNING NORTH OF THE METRO AREA. * SNOW ACCUMULATIONS OF 2 TO 3 INCHES ARE POSSIBLE WEDNESDAY NIGHT AND THURSDAY MORNING ACROSS THE METRO AREA... ESPECIALLY NORTH OF THE TENNESSEE/MISSISSIPPI STATE LINE. AMOUNTS OF 1 TO 2 INCHES ARE POSSIBLE ACROSS NORTH MISSISSIPPI. SNOW WILL LIKELY START AFTER MIDNIGHT /EARLY THURSDAY MORNING/ AND TAPER OFF BY NOON THURSDAY. * NORTHWEST WINDS BETWEEN 15 AND 25 MPH WITH GUSTS TO 30 MPH ARE POSSIBLE THURSDAY BEHIND THE STRONG COLD FRONT. TEMPERATURES WILL LIKELY FALL THROUGH THE AFTERNOON THURSDAY. * THIS IS THE FIRST WINTER STORM OF THE SEASON AND IS EXPECTED TO HIT THE MIDSOUTH DURING RUSH HOUR THURSDAY MORNING. EXPECT HAZARDOUS TRAVEL CONDITIONS THROUGH THURSDAY. A WINTER STORM WATCH MEANS THERE IS A POTENTIAL FOR SIGNIFICANT SNOW... SLEET... OR ICE ACCUMULATIONS THAT MAY IMPACT TRAVEL. CONTINUE TO MONITOR THE LATEST FORECASTS. It's been an unusually cold start to 2010. While normal high temps are near 50 with lows near freezing, we've been running 20+ degrees below average for daytime highs. In fact, since 6pm New Year's Day, temperatures at the Memphis airport have been above freezing for only 2 hours! I expect this bitter trend to continue through at least noon on Wednesday, which will mean only 2 hours above freezing out of a consecutive 114 hour period. Once we leave Wednesday afternoon behind, that streak will start anew with even COLDER temps coming for late this week and into the weekend. In fact, I suspect that by Monday morning we will have had maybe only 6 hours or so of above freezing weather over a 10 day span. Wow! This will likely be the coldest weather we've experienced in at least 6 years so plan accordingly. More information on protection from the extreme cold will be forthcoming on this blog as we head towards the coldest days later this week. As for snow chances, my thinking has not changed a great deal today. I still believe that there is a high likelihood of snow Thursday, a high likelihood of some accumulation, and a moderate chance that we could see snow totals of 2-3" over the region by mid-day Thursday. Latest computer model runs, which have been fairly consistent of late, show snow starting Wednesday night, probably around or after midnight, with most accumulating snow leaving the area by early afternoon. A STRONG ARCTIC COLD FRONT WILL PUSH THROUGH THE MID-SOUTH THURSDAY. ACCUMULATING SNOW IN ASSOCIATION WITH THE FRONT IS LIKELY WEDNESDAY NIGHT AND THURSDAY. EXACT SNOW AMOUNTS REMAIN UNCERTAIN AT THIS TIME... BUT PLANS SHOULD BE MADE FOR THE POSSIBILITY OF AT LEAST A COUPLE OF INCHES OF SNOW WITH ROADS BECOMING HAZARDOUS. STAY TUNED TO LATER WEATHER FORECASTS FROM THE NATIONAL WEATHER SERVICE AND MEMPHISWEATHER.NET. A SIGNIFICANT ARCTIC OUTBREAK IS EXPECTED FOLLOWING PASSAGE OF THE COLD FRONT THURSDAY. BITTERLY COLD AIR... PERHAPS THE COLDEST SINCE AT LEAST 2003... WILL PLUNGE INTO THE MID-SOUTH DURING THE DAY THURSDAY AND REMAIN OVER THE AREA INTO THE WEEKEND. LOW TEMPERATURES WILL DIP INTO THE SINGLE DIGITS ACROSS MOST OF THE AREA... PERHAPS BOTTOMING OUT NEAR 10 DEGREES IN THE CITY CENTER. WIND CHILL READINGS BETWEEN MINUS 5 AND MINUS 10 DEGREES WILL BE COMMON. MID-SOUTHERNERS SHOULD PLAN AHEAD FOR THE POTENTIAL SNOW LATER THIS WEEK AND THE EXTREME COLD TO OCCUR AFTERWARDS. PRECAUTIONS SHOULD BE TAKE TO KEEP WATER PIPES FROM BURSTING. LIVESTOCK AND PETS WILL NEED CARE FROM THE COLD. CAR BATTERIES SHOULD BE CHECKED TO ENSURE THEY WILL START IN THE EXTREME COLD. Potentially dangerously cold conditions will occur throughout the upcoming week as Arctic high pressure controls the weather for the first half of the week. A low pressure system will then be the weather-maker everyone is watching for the latter portion of the week, followed by yet another strong Arctic high pressure system for next weekend that could bring even colder air to the Mid-South. Starting with early week cold - after a high of 34 today, the Mid-South will remain below freezing until perhaps Wednesday (my forecast high for the city on Tuesday is 33; suburbs will probably stay at or below freezing). Overnight lows will be in the teens for most areas the next 3 nights with wind chill values in the single digits Tuesday and Wednesday mornings. Daytime wind chills will only rise into the 20s. By mid-week, the first winter storm of 2010 for the southern U.S. will be coming together over the southern Rockies with another Arctic high pressure system right on it's tail dropping south out of Canada. With cold air in place and Gulf moisture streaming north ahead of the low, snow chances increase late Wednesday night and last through Thursday. With very cold air behind the system, flurries could continue into Friday as highs remain in the 20s (at best - one computer model keeps us in the teens). As to snow amounts, this is probably the hardest part of the forecast this many days out and will likely change (perhaps daily) until it occurs. My best guess for the metro area right now is up to a couple of inches of accumulation. Again, highly subject to change (up or down)... stay tuned. Trailing the low, bitterly cold polar air will entrench itself over the region. Single digit lows in outlying areas will be entirely possible Saturday morning, with wind chills below zero Friday and Saturday mornings. Long-range models don't show us breaking out of the very cold air until at least early next week. The next 10 days or so could be the coldest air the Mid-South has experienced in many years. Wind chills could easily approach and drop below zero late in the week, but it will still be bitter to start the week as well. Take all necessary precautions against the cold. Cover outdoor faucets, let indoor faucets (especially those on exterior walls) drip overnight, bring outdoor pets inside during prolonged cold conditions or excessively low wind chills, check on the elderly, and watch where you place portable space heaters. Cold weather doesn't need to be tragic. 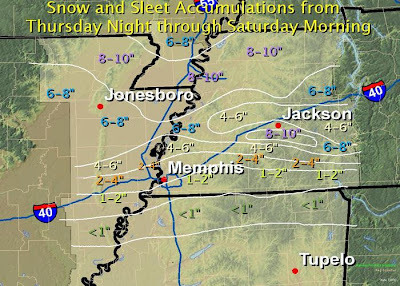 MemphisWeather.net will have full coverage of the cold weather and potential winter storm on this blog, the MWN forecast, Facebook, and Twitter.